His one wish is to win her heart. First, he must prove his worth. He leaves with a hope to return and a promise to never forget. ALADDIN, a rescued orphan from the Holy Land, is growing up at the cathedral and orphanage of Hagenheim. Quickly earning a reputation as one who is helpful, kind, and eager to do what's right, he is well on his way to becoming the duke's steward. Yet even with the favor of God and man upon his life, will he ever be good enough for what he truly desires? LADY KIRSTYN, daughter of Duke Wilhelm and Lady Rose, is growing up privileged and protected at Hagenheim castle. Feeling insignificant in the midst of so many siblings, she forges an unlikely friendship with the handsome, dark-skinned orphan. Could they ever be more than friends? 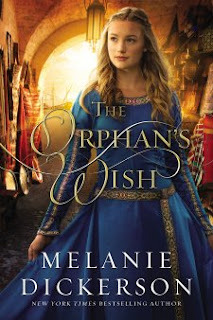 The Orphan's Wish is book 8 in the Hagenheim/Fairy Tale Romance series and is a Christian retelling of Aladdin. Lady Kirstyn and Aladdin spend their childhood going on all kinds of adventures together and becoming each other's favorite companion. When they both realize their friendship may be leading to something more, Aladdin risks it all to leave servanthood behind and to make a name for himself. Soon after Aladdin leaves to seek his fortune, a traitorous orphan girl and a vengeful merchant's son take Kirstyn on a dreadful journey. Both Aladdin and Kirstyn discover that it may be more than their stations threatening to keep them apart for good. I love fiction set during medieval times and it was wonderful to be back in Hagenheim again! I've read every single book in this series (all of Melanie Dickerson's books for that matter) and have loved them all. This book, along with the rest in the series, is lighthearted fiction with a fairy tale feel minus the magic. While The Orphan's Wish probably isn't my favorite in the Hagenheim series, it was still good. Aladdin is extremely likeable and reminds me of one of my favorite characters in the Old Testament. The book has an encouraging message of trusting God even in the midst of trial and having integrity no matter the circumstances. In my opinion, it's quite wholesome enough for teens. The Orphan's Wish can be read as a stand alone, but I'd recommend reading the books in this series in the order in which they were written. Visit Melanie Dickerson's website to view the books in order.